When I was department chair, I regularly asked the Registrar during course registration for the number of students requesting seats in our courses during the various “rounds” of registration. Round 1 is when students upload their first-choices for classes. Round 2 gives students the chance to fill out their schedule by requesting space in courses that did not fill in the first round. As such, Round 1 represents raw “demand” for our courses. I would track how many of our courses are so in demand as to have more requests than seats; and which courses were under-enrolled. Here’s a controversial question: should I have as a goal that demand across courses in the department be roughly constant? That is, that no classes are more “popular” than others? That we have few “unpopular” courses? Should supply be matched to demand? Now, courses are over or under-enrolled for lots of reasons: interest in the topic (should we ditch unpopular topics? ), unpopular times (should we ditch early morning classes or Friday classes? ), unpopular professors (no comment), and so on. It turns out that my colleagues and I offer courses that we think are important for students, and we might not think “demand” from them is a good barometer of what we should offer. Now, for the data. 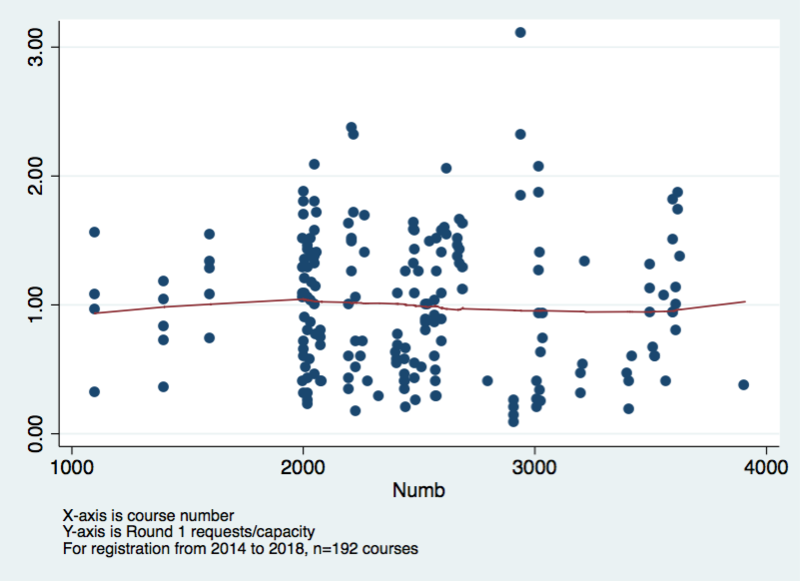 Below, I show the Round 1 demand ratios (requests/capacity) for courses between 2014 and 2018. The x-axis is the course number (1000s are intro lectures; 2000s are electives; 3000s are advanced seminars). According the smoothed line, the average is such that demand=supply, but the variation is all over the place. On average, we are doing something right, but that’s not a great metric given the incredible variation across our courses. Some are just incredibly popular, and some….not so much. One approach is to work and change this, to flatten the variations. I’m not sure we could or should, though. Which is to say, I’m glad I’m no longer the chair of the department.